The Forum, Norwich, appeals for stories about Norfolk soldiers who fell in the Second Battle of Gaza, 17-19 April 1917. We are appealing for the people of Norfolk to share their stories and memories of relatives who fought in the Second Battle of Gaza to mark its centenary in April 2017. There are hundreds of Norfolk men who served in The Norfolk Regiment & fought in this battle and here at The Forum we’re keen to hear from local people who may also have photographs, letters and objects relating to the Second Battle of Gaza. 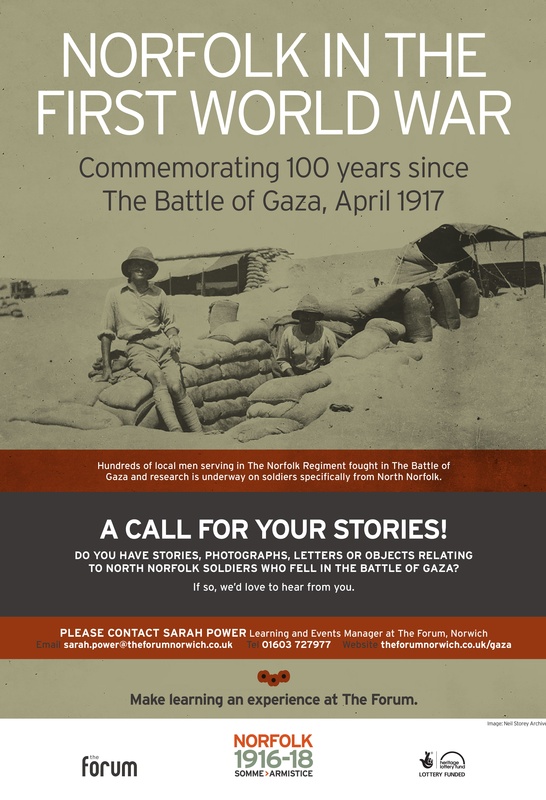 If you have any information on connections to the Second Battle of Gaza please get in touch with The Forum’s Learning Manager, Sarah Power via email: sarah.power@theforumnorwich.co.uk or telephone: 01603 727977. The Forum is currently working with primary and secondary schools from King’s Lynn and North Norfolk on the young person’s strand of the project called ‘Finding the Fallen’. Students are spending three days with local military historian, Neil Storey, to include research sessions, object handling and a visit to their closest war memorial to uncover information about soldiers’ local roots and their fates in the Battle of Gaza. While The Forum is particularly keen to receive stories about men from these areas, we also welcome any information about the involvement of any Norfolk men in the Battle of Gaza that people may hold. All of the research and learning from the project will culminate in a Battle of Gaza exhibition starting at The Forum and the Norfolk & Norwich Millennium Library on 18 April 2017. Following this, the exhibition and an accompanying film will go on tour to other schools and community venues around Norfolk. This entry was posted in Family Reminiscence, Information needed, research project. Bookmark the permalink. many thanks for sharing this with us, have you also contacted Sarah Power (named in the post) with these details? I have had a quick look on our Picture Norfolk catalogue to see if we have a photo of your relative there and I don’t think we do, however there are some images of the Norfolks during their time in Egypt and Gaza – if you go to Picture Norfolk and search for Gaza some images arrive. Images may yet appear of Pte Reynolds, the exhibition planned for April by the Forum about their Gaza research might be of interest to you too – more details as we get them.